From Fail to Win! Gadgets and Inventions by Neil Morris. A From Fail to Win! Learning from Bad Ideas Book. Review: Do you like stories that that tell you about history and the future? If you do, then this is the book for you. In the book, From Fail to Win: Gadgets and Inventions by Neil Morris, it shows how scientists can fail or win. In the book, From Fail to Win: Gadgets and Inventions, there is an invention made by Thomas Edison - concrete furniture. Edison believed that people would like concrete furniture and other concrete items. But, the author shows how Edison's idea failed since people felt that concrete furniture would be uncomfortable and too expensive. Therefore Thomas Edison sold all of the concrete to a company to make something else. Also in the book, the author mentions an invention made by a phone company which was called the videophone. This phone was originally introduced by AT&T as a phone that allowed the callers to see one another while they were speaking. This was a fail because it was an expensive phone. But, maybe it was an invention that was simply ahead of its time. Find out what other inventions were made that were never released by reading the book From Fail to Win: Gadgets and Inventions. This book taught me that even the smartest of scientists can create a failure. 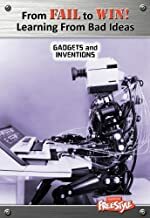 After reading From Fail to Win: Gadgets and Inventions, I learned about many cool inventions that I would have never known about; I really enjoyed this book. Even though it's a small book, I recommend it to any one that likes a book with awesome inventions. It is a perfect book for libraries and schools and even your home bookshelf. Review written by Eric (6th grade student). We would like to thank Media Masters Publicity for providing a copy of From Fail to Win! Gadgets and Inventions for this review. Have you read From Fail to Win! Gadgets and Inventions? How would you rate it? Thanks for sharing your review, Eric. This seems like an interesting book about inventions. Thanks again.